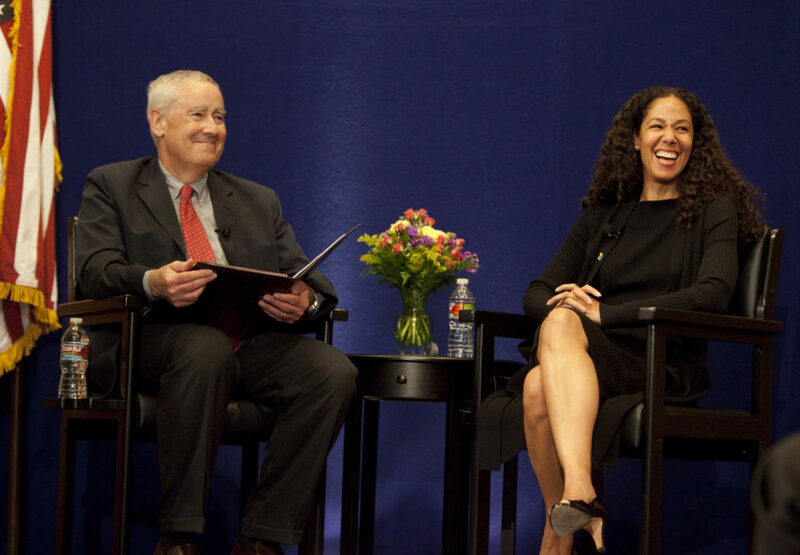 White House Deputy Chief of Staff Mona Sutphen, right, smiles during a talk with Bill Lacy, director of the Dole Institute of Politics, on Thursday at the institute. A top Obama White House aide on Thursday afternoon in Lawrence said there was a “clear anti-incumbent mood” with the November congressional midterm elections approaching. “I think a lot of the frustration and anger you’re seeing is some of the same impetus that actually propelled Obama into office, which is people are feeling frustrated that the government and Congress maybe don’t have the same priorities or are not focused on the issues Americans want them to focus on,” said Mona Sutphen, a deputy chief of staff for Obama, during a forum at the Dole Institute of Politics. The question-and-answer session with Bill Lacy, the institute’s director, was standing-room only with 140 people in the Simons Media Room. Chairs were set out for 100 people to listen to the audio outside in Hansen Hall. The White House deputy chief of staff touched on several topics Thursday at the Dole Institute of Politics. Two congressional veterans, Rep. Alan Mollohan, D-W.Va., and Sen. Robert Bennett, R-Utah, recently lost their seats in primaries. Sutphen said that initially commentators believed the elections would be a problem for Democrats because of the recently passed health care overhaul. “It’s much more deep-rooted than that. It’s a stronger kind of anti-incumbency movement that’s out there,” she said. A lot also can happen in the next several months. In taking questions from Lacy and the audience, she spoke on numerous topics and issues during the session, including the grind of her White House job and trying to balance moving forward Obama’s policy agenda with responses to several crises, like the BP oil spill and the West Virginia coal mine disaster. Lawrence resident Jim Mullins, a former Douglas County Republican chairman and once a Reform Party candidate for state Senate, said he believed the new federal health care law is going to cost him “a lot of money” by taking away his Medicare Advantage plan. “All I would say is that I think you need to wait and see how it’s implemented because I think there’s a lot of disinformation about how it’s going to affect individual people differently,” she said. “Nobody wanted to write a huge check like that to keep the economy from going off a cliff,” she said. She also said the proposed financial regulation overhaul before Congress was at the center of an intense lobbying effort. Sutphen said the White House is seeking to make sure trading of derivatives falls under more oversight. A C-Span crew taped the event. Lacy said it was difficult for the institute staff members to predict turnout because afternoon events typically draw smaller crowds. The film crew was already set up in the media room, meaning they couldn’t move the event outside to the larger Hansen Hall.